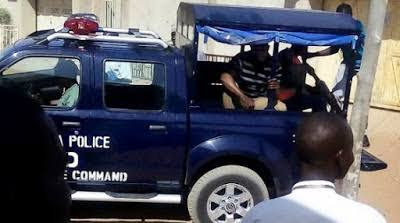 The Katsina State Police Command at the weekend said it had arrested a syndicate of armed robbers that specialised in kidnapping people for ransom. Several weapons, including one AK-47 rifle with breach number 4181, were allegedly recovered from the syndicate. A statement by the command’s spokesperson, Gambo Isah, said the suspects were arrested on April 17 in Kaliyawa-Mahuta village, Dandume Local Government Area of the state by the Special Anti-Robbery Squad. The statement gave the names of the suspects as Muntari Jibrin, 25; Dabo Hassan, 60; and Abdullahi Samu, 20. They all hail from Rugar Dabo in the Dandume Local Government Area of Katsina State. Others are Tukur Mamman, 20 (Faskari LGA, Katsina); Babangida Saidu, 27 (Tsafe LGA, Zamfara) and Ishaka Yusuf, 20 (Sabuwa LGA, Katsina). The police spokesperson added, “The suspects have confessed to various armed robbery/kidnapping incidents along the highways in Zaria, Kaduna State and Funtua, Sabuwa and Dandume LGAs of Katsina State. In a related development, the command said it had arrested a 38-year-old man alleged to be a fake medical doctor. The command said, “On April 16, 2018 at about 1630hrs, based on a tip-off, the command succeeded in arresting one Joseph Umaru (male), 38, an indigene of the Ofu LGA, Kogi State, residing in Kwado Quarters, Katsina. “The suspect has been parading himself as a medical doctor in the Kaita LGA of Katsina State, attending to patients and performing different types of medical procedures, including prescription of drugs, injections, taking of blood samples and blood transfusion. “Nemesis caught up with him when he was arrested by the police. Seven different certificates of Colleges of Health Technology, Kankia and Funtua, suspected to be forged documents, were recovered from his house. “Other exhibits recovered were different types of surgical equipment, drugs, several blood samples, hospital syringes and needles, and hospital receipts and prescription booklets.